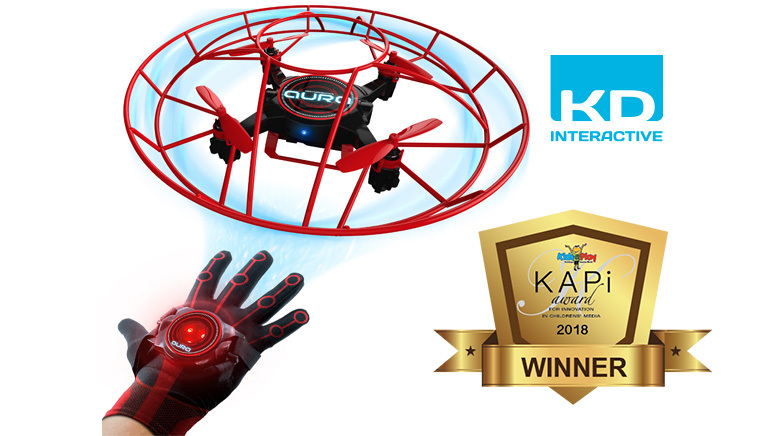 The all-new Aura Drone with Glove Controller from KD Interactive is the easiest, most amazing way to fly an indoor drone! What separates Aura (6+, MSRP: $99.99) from other mass market toy drones is that it’s the first one to utilize Gesturebotics™ powered by LocoRobo Innovations, where kids can pilot the drone by simple hand gestures—just like a super hero! Previously only used in military applications, this innovative gesture technology eliminates the frustrations of traditional joysticks and multi-axis controls, introducing a whole new way for beginners and enthusiasts to fly toy drones all around the playroom and even perform cool tricks like a sideways flip. Auto Takeoff and Auto Landing features get kids airborne faster and ensure a safe landing while the Aura’s safety frame offers added protection for fun and safe indoor play. Plus, multiple Aura drones can be flown at once, for fun group play or even racing. Aura, which was recently named to The Toy Insider’s Top Tech 12 list of the hottest tech toys for the holidays, was invented by Dr. Pramod Abichandani, co-founder of LocoRobo Innovations Inc. and professor of robotics at NJIT.